Exhibitors are dabbling in a host of new technologies and applications, from direct-view LED displays to VR gaming. Tim Kridel explores why — and how – they could create opportunities for AV firms to expand into the cinema market. On March 22, Zurich’s Arena Cinemas will become the first European theatre — and one of just a handful in the world — with a direct-view LED screen. It’s an ironic milestone: LED technology enables the big yet affordable TVs that have cut into theatre admissions, which declined 6% over the course of 2017, according to the National Association of Theater Owners. But now LED technology could give exhibitors another tool for making and saving money. Arena uses Samsung Electronics’ Cinema LED Screen, which is nearly 10.3 meters wide, supports 4K and has a peak brightness level of 146 foot-lamberts (fL). The world’s first Cinema LED installation was in July 2017 at Lotte Cinema World Tower in Seoul. Sony is among the other vendors developing direct-view LED displays for cinema applications. Deploying a direct-view LED display is a lot different than replacing one projection technology with another projection technology. For starters, LED doesn’t require a projection booth. That space could be used to generate additional revenue, such as premium seating. Arena Cinemas converted its booth into a private lounge. Depending on the theatre, an LED screen might incur higher installation costs compared to projection. “The LED screens weigh 5 tons, so you have to build a cinema a hell of a lot stronger,” says David Hancock, IHS Markit director of research and analysis for cinema and home entertainment. LED is a new technology not only for exhibitors, but also for the specialised integrators serving the cinema vertical? So it’s possible that LED could create an opportunity for traditional AV firms to expand into cinema. LED also could enable cinemas in new locations or breathe life into struggling ones. Like laser projection, LED displays also could spur more 3D ticket sales by alleviating the brightness problem that meant an underwhelming experience with older technologies. But audio has to be addressed to avoid becoming the new weak link for both 3D and 2D. All of these factors have some industry watchers speculating that LED will fundamentally change the types of technologies, companies and venue designs in the cinema space. “LED has the potential to be a genuine disruptor of the business,” Hancock says. Direct-view displays come on the heels of two other formats and technologies generating buzz: high frame rate (HFR) and 4K. Meanwhile, some older formats are holding their ground. Virtual reality (VR) is another question mark. So far, it’s been a niche play. For instance, VR game systems in the lobby could promote films in the hope of getting players to buy a ticket. “This can be a good tool to keep visitors in the lobby longer and generate more concessions sales,” says Till Cussmann, CinemaNext vice president. Like many exhibitors, Alamo Drafthouse is waiting to see if and how filmmakers embrace VR. But other exhibitors question whether VR will ever have a place in the auditorium. Multi-player gaming is a form of togetherness. For years, some exhibitors rented out their auditoriums for non-film events, such as all-hands business meetings. Flat or declining ticket sales have increased interest in rentals. The opportunity varies based on several factors, starting with the theatre’s location. “There are relatively few that can do it: city-centre cinemas [in] big cities, business centres,” Hancock says. Exhibitors also are competing with specialised theatres such as those in museums and other cultural attractions. Those “institutional theatres,” as they’re sometimes called, have cachet that helps attract event organisers and attendees. “There’s no cachet with going to an event at the mall [multiplex],” says Derek Threinen, vice president of film distribution and business development at Giant Screen Films / D3D Cinema, which specialises in the institutional market. Sales staff is another competitive factor. But as the cinema rental market matured, businesses have launched to help exhibitors go after non-film opportunities. “Companies like Fathom Events have a huge offer for alternative content and help also to market it to the right audience,” Cussmann says. “The main challenge today is to connect the right audience to the right content without having the exhibitor bearing too much risk that the auditoriums are empty and that he loses revenue compared to regular movie screenings. So the evolution from classical cinemas towards visual entertainment centre has started and will continue to change the landscape. Event organisers also look at whether a theatre can support a variety of AV inputs, such as wireless mics, laptops and Skype feeds. “The majority of current digital projector setups these days come equipped to handle most outputs,” Sandel says. “We just know when building venues to include front-of-house connections. Having state-of-the-art projection and sound equipment is really the most important part when marketing a venue even for non-film events. 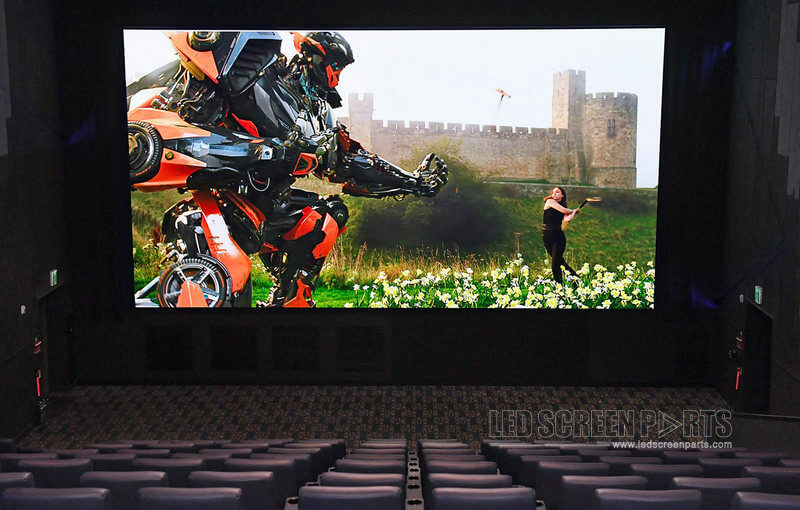 Direct-view LED displays also could help cinemas go after the non-film market. “With this new technology, auditoriums can be screening content with full ambient light on without any compromise on quality,” Cussmann says. For years many institutional theatres have offered 4D technologies, such as seats that move and bursts of scents. Now cinemas are increasingly adding 4D to spur ticket sales. For example, CJ 4DPLEX’s ScreenX platform gives audiences a 270 degree view. One way is by adapting technologies from other verticals, such as theme parks. If that strategy is successful, it’s another potential way for AV firms in those verticals to expand into the cinema market. “We have developed our own 4DX VR technology that’s currently featured in theme parks and arcades around the world,” Choi says.